What are the latest developments in the Iraq situation? The situation in Iraq is slowly improving. In 2007 the U.S. responded to the continuing instability in Iraq by augmenting the number of security forces there. The policy was referred to as "the surge" and was moderately successful in reducing casualties to this strife torn region and a semblance of normal civilian life is finally beginning to reappear. The U.S. troop presence reached a peak in 2008 and there has been a reduction since. U.S. military casualties have been signficantly reduced. Iraqi civilian deaths have decreased as well. Despite the improvement, the political situation remains complicated by ethnic and religious tensions. Although American public opinion was initially supportive of the war effort, most now believe it was not worth the effort. A 2008 poll indicated that Americans also believed that the U.S. should end the occupation soon even if it means leaving Iraq unstable. What developments led to the U.S. invasion and occupation of Iraq? In September 2002, at behest of the U.S. the UN Security Council issued a resolution which required unconditional Iraqi compliance with weapons inspections. The resolution left open the possibility of military enforcement in the event of noncompliance. After considerable internal discussion, Iraq agreed to the terms of the resolution. The resulting months of inspections produced inconclusive results. Although there were no major discoveries of Iraqi weaponry, the degree of Iraqi cooperation did not fully satisfy the U.N. inspection team. Critics of the inspection process noted that Iraq had the capability of frustrating any organized inspection by putting the chemical and biological weaponry in vehicles constantly moving throughout the country thus evading the inspection process. Perhaps most revealing, Iraqi scientists were unwilling to be interviewed regarding their knowledge of the Iraqi weaponry program without the presence of a representative of Saddam Hussein. This suggested that to protect their families, these individuals did not want to be suspected of revealing Iraqi secrets. The U.S. failed in its attempt to obtain a new U.N. resolution which would authorize imminent military action. With the major exception of Great Britain, there was not support for this position among the U.N., the Security Council and the U.S. NATO allies. Instead, these countries supported an extension of the inspection process. The U.S., joined by a distinct minority of nations (the so-called "coalition of the willing"), ultimately decided to bypass the United Nations and take matters into its own hands and began its assault on Iraq on March 19, 2003. Congress overwhelmingly provided President Bush the authorization to undertake this action. The military campaign was quickly successful. There were reportedly minimal casualties for U.S. and allied troops. The extent of Iraqi casualties are unclear but they appear to be less than they were during the Kuwait war. There was considerable relief and some celebration by ordinary Iraqis after the successful overthrow of Saddam but these attitudes were quickly changed by the ensuing chaos in the country during the occupation. It is apparent that there have been significant innocent Iraqi casualties resulting from U.S. efforts to resist the insurgency and that such incidents have helped fuel anti-U.S. sentiment among many Iraqis. The occupation period which now is nearly three years old has been difficult. The period immediately subsequent to the U.S. military takeover was characterized by chaos and widespread looting with minimal law enforcement from U.S. forces. Subsequently the U.S. has engaged in the difficult process of reconstruction while combating and being victimized by a steady amount of violent insurgencies from Iraqi terrorists. The situation has been tense but so far the U.S. has resisted suggestions that the reconstruction be a multinational effort. On December 14, 2003, Saddam Hussein was finally located and captured by U.S. forces and he defiantly awaits trial by an Iraqi tribunal. In May 2004, graphic pictures involving U.S. Army mistreatment of Iraqi prisoners became public, exacerbating an already tarnished image of the U.S. occupation effort. The U.S. turned over the government to Iraqi control on July 1. Nevertheless, the U.S is continuing a military presence for the indefinite future in order to provide stability among competing ethnic and religious influences in the country. In the summer of 2004 there was an uprising led by radical Shi ite cleric Moqtada Sadr in the shrine city of Najaf. Although the rebellion was successfully put down through U.S. military force, the situation has continued to add to the ill will generated by the U.S. presence. The other major controversy concerning the Iraq situation involves whether there was sufficient justification for the military action undertaken in March 2003. The fact that weapons of mass destruction have not been located has been a major surprise which has exposed the unreliability of intelligence materials which were used by the U.S., Great Britain and others to justify the invasion. There are charges that accurate intelligence regarding the Iraqi was ignored by a zealous Bush Administration determined to remove Saddam Hussein from the world stage. There is also the matter regarding whether Iraq was linked to al-Queda terrorist activity. Although Administration officials, notably Vice President Cheney, insist that a connection existed, the 9/11 Commission concluded otherwise. How did Iraq become a country? Iraq (Click to see map) was created from territory which was part of the Ottoman Empire which was destroyed after World War I. 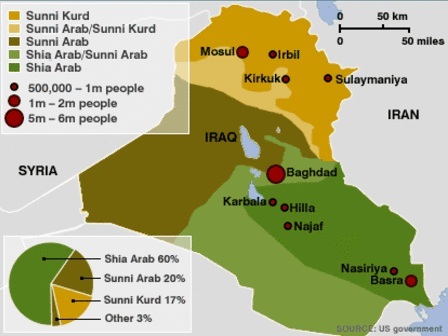 The borders of Iraq were created without regard to ethnic, political or even geographic reality. The country is not entirely Arab. The northern mountain portion of the country is inhabited by Kurds, a mountainous tribal ethnic group that has its own language and distinct cultural heritage. The Arabs are divided by Sunni Muslims in the northern and central portions of the country and Shiite Muslims in the southern portion. The political divisions between Sunni and Shiite Muslims in Iraq have became less important starting in the 1980s when the country began developing under Baath party rule. On the southernmost portion of the country adjacent to the Persian gulf is the present country of Kuwait, a trade center which had a special relationship with Great Britain dating to the 18th century. Kuwait remained a British protectorate after Iraq was created. But Iraq has wanted to have Kuwait included in its territory. In 1939, Iraq mobilized its army to conquer the tiny land, which was still a colony of Britain but cancelled the invasion. In 1961, when Kuwait was finally given its independence from Great Britain, Iraq immediately began invasion preparations and only backed down when Britain sent troops back into the region. Saddam Hussein emerged from the Baath party. What is the Baath party? The Baath Party began in Syria during the 1940s . Its leading intellectual was a Christian, Michel Aflak, who remained a leader of the party until his death in 1989. Arab unity is at the core of Baath doctrine and prevails over all other objectives. It advocates a socialist system which emphasizes development for the benefit of Arab society. The party organization is similar to the Communist party. The basic organizational unit of the Baath is the party cell. Composed of between three and seven members, cells function at the neighborhood or the village level, where members meet to discuss and to carry out party directives. As in Communism, this type of organizational structure particularly rewards members who are intelligent, amoral and manipulative. Presently, about 10% of Iraqis are estimated to be Baath party members. The Baath party had initial political success in Syria, but its leaders were exiled in 1961 after Syria's experiment with a union with Egypt failed. Michel Aflak and others took up residence in Iraq. In 1963, the Baath party succeeded in taking power in Iraq but it did not remain in power long. The party took power for good in 1968 when General Ahmad Hasan al Bakr seized power. His deputy was Saddam Hussein. The Baath party remains committed to a unified Arab nation even though as a practical matter, domestic concerns in Iraq have commanded the most attention. Nonetheless, current Iraqi foreign policy under Saddam Hussein is significantly motivated by Baath party ideals. What kind of person is Saddam Hussein? How did he come to have such power? He is determined, capable, intelligent, amoral, and manipulative. He is obsessed with power and is determined to have the military arsenal capable of providing him such power. The most comparable 20th century political figure is easily Josef Stalin and there is evidence that Saddam Hussein has closely studied Stalin. Saddam Hussein was born in 1937 to a poor peasant family near Tikrit in central Iraq. His father died prior to his birth and as a result he was unwanted by his mother. His mother then married his father's brother and young Saddam was poorly treated by his stepfather. These early influences partly explain his sociopathic personality which seems completely devoid of any human empathy whatsoever. When Saddam was only 10, he was impressed by a visit from his cousin who knew how to read and write. He confronted his family with his wish to become educated, and when they turned him down, he left his home in the middle of the night, making his way to the home of his maternal uncle where he remained. Saddam's upbringing was strongly influenced by this uncle who had been a soldier who had fought for Iraqi nationalists against Great Britain and had been imprisoned because of this activity. He tutored Saddam in his view of Arab history and the ideology of nationalism and the Baath party. Together Saddam and his uncle moved to Baghdad when Saddam went to secondary school. With Nasser assuming power in Egypt, Arab nationalism concepts were very popular with students although the Baath party was illegal and its activities were clandestine. Saddam Hussein soon became active in the Baath party as a gun man, and he participated in the assassination attempt on the country's strong man, General Kassem, in 1959. Then he went into exile in Cairo. There is evidence that his cooperation with the CIA began at that time as he made numerous trips to the American embassy while in exile. He returned to Iraq after 1963 when Kassem was ousted by the Baaths and was elected to the National Command. There is some basis to believe that General Kassem's ouster was assisted by the CIA which was motivated by a fear of Kassem's increased ties to the Soviet Union. When the Baath party assumed power in 1968, again with the assistance of the CIA, Saddam Hussein emerged as the primary deputy leader to Muhammad Bakr, a general who became President. Very soon, because of his hard work, most of the actual control of the government was assumed by Saddam Hussein. Bakr surrendered everything to Saddam, because Saddam worked an eighteen-hour day. In no time at all, Saddam was head of Security, he was head of the Peasants Department, he was head of Relations with the Kurds, he was head of the Committee that controlled the oil. He was head of the committee that controlled relations with the Arab countries. He was head of the Workers Syndicate. The Baath government developed by Saddam Hussein in the '70s soon won the respect of the Iraqi people and other Arab countries. With the assistance of oil money, economic development began in a manner consistent with Baath party socialist ideals. Land reclamation projects, railroads, highways, mining and manufacturing all underwent rapid development. These projects were successful because Iraq had a significant population unlike some of the sparsely populated oil producing countries and many were educated. It soon became necessary for Iraq to import labor from other Arab countries. These workers were welcomed and treated well by the Iraqi government. When Saddam Hussein assumed full power in 1979 he and the Baath party were at a peak of popularity among all levels of society. Educated Iraqis knew Saddam was tough and that he ruthlessly eliminated opponents. But his policies had helped developed the country on Arab terms and had improved the daily lives of millions of Iraqis. But the development of a potentially powerful oil-rich Arab nation in Iraq which was unbeholden to Western powers was of great concern to the United States and Israel. In 1980, shortly after formally assuming power, Iraq launched a devastating 8 year campaign against Iran? Why? There is really no satisfactory answer. The war resulted in the death of hundreds of thousands on both sides. It devastated both countries economically. Ultimately nothing was gained by either side. Iran could justify its response by the fact it was provoked. But the fact that Iraq was willing to expose its military to such a massive number of casualties for an unclear objective was the first illustration of Saddam's utter disregard for the value of human life. Most analysts suggest that Saddam Hussein resurrected a decades-old border dispute at a time that Iran was presumably weakened through a change in government. There was also historical ethnic antipathy between Persians and Arabs. At the very beginning of the war, Iraq gained some territory. But the war served as a unifying cause for the attacked Iranians who were well equipped with U.S. supplied military weaponry. When Iran recovered its occupied territory and began attacking Iraq, the international community and Arab states in particular began to support the Iraqi cause. The war ended when Iraq began to use chemical weapons to repulse Iranian advances. The U.S. behavior regarding this conflict is very puzzling. At the outset of the war, the U.S. did not have relations with either country. U.S. public opinion was highly hostile to the religious Iran regime because of the months-long hostage crisis in 1979. U.S., Russia and other nations helped supply Iraq with military assistance during this period. At the same time, the U.S. surreptitiously assisted Iran with weaponry which ultimately caused the "Iran-Contra" scandal and more Congressional oversight regarding covert operations. Despite its massive losses, Iraq gained some respect in the Arab world for having the resources and determination to conduct the war. Although the prosecution of this war cost Saddam Hussein some domestic popularity, his control of the country was so great that opposition could be easily and ruthlessly suppressed. What precipitated Iraq's subsequent annexation of Kuwait and the ensuing Gulf War? The Iran-Iraq war had been largely financed by the oil-rich gulf states, especially Kuwait. Now that the war was over, Kuwait was demanding its loans be paid back. Saddam accused Kuwait of deliberately flooding the market with oil so that the value of Iraq's oil declined. Apparently the United States told Iraq that it was not officially interested in the issue. Saddam Hussein seems to have taken that to mean he had a free hand in dealing with his grievances, and on August 2, 1990, he invaded Kuwait, easily overrunning the little country. He seriously failed to predict the international reaction. What followed was the 1991 Gulf War sanctioned by the United Nations in 1991 which ultimately decimated the Iraqi military, leaving Saddam Hussein vulnerable to dissidents in Iraq. For reasons which are not entirely clear, the U.S. did not engage in either a covert or overt effort to support either the Kurdish rebels in the North nor the opposition in southern Iraq during the aftermath of the war. The remnants of Hussein's army were able to quell these uprisings and thus Saddam Hussein remained in control. How did Saddam Hussein successfully frustrate weapons inspectors in the years after the gulf war? Basically because there was no international willingness to again engage Iraq in a protracted military confrontation over this issue and economic sanctions proved to be ineffective. Under the terms imposed by the United Nations at the end of the Gulf War, U.N. weapons inspectors were assigned the task of ensuring that Iraq would no longer be able to use weapons of mass destruction. The extent of the weapons programs, and the secrecy surrounding them, left the inspectors with a difficult job to do. The inspectors consistently met resistance from Iraqi authorities. As the decade continued, the economic sanctions imposed on Iraq caused Iraqis much suffering but Saddam Hussein deflected the blame for this among Iraqis to the United Nations and especially United States. Humanitarian organizations began clamoring for an end to the sanctions in response to the human suffering in Iraq. A U.N.-sponsored humanitarian "oil for food" program was implemented in 1996 and was recently extended to June 2002 but Saddam Hussein has not fully taken advantage of this program. The United States has engaged in military action against Iraq twice during this period. Why? In April 1993, Iraqi agents were involved in a failed assassination attempt against former President Bush while he was visiting Kuwait. The U.S. responded with a missile strike in June 1993. In December 1998, the U.N. removed its inspectors from Iraq after issuing a report that indicated that its efforts to fully explore the full extent of the Iraqi weapons program, particularly with respect to biological weapons, had been frustrated. In response, Iraq accused the weapons inspectors as operating as spies for Israeli and western intelligence. The U.S. and Britain (without U.N. approval) immediately launched a four day bombing attack aimed at suspected weapons locations. Iraq has refused to permit inspectors to return since that date. Is there evidence of Iraqi complicity with Al-Queda terrorists? Yes, although a clear connection has not been established. A book written by Laurie Mylroie in 2000 sets forth in detail the basis for linking Iraq with the Al Queda 1993 World Trade Center bombing and other planned terrorist activity. The commission investigating the Sept. 11 attacks determined that Iraq and Osama bin Laden did not collaborate on the attacks. The Bush Administration responded by maintaining there was a working relationship between Iraq and al-Qaeda even if Iraq was not directly involved in the planning and execution of the Sept. 11 attacks. What is certain is that Saddam and Al-Queda shared the goal of unifying Arabs in opposition to the United States and they both were not adverse to using terrorism as a means to achieve this end. But the secret nature of terrorist activities and of government intelligence which tracks such activities makes it very difficult to assess the degree to which there was cooperation. It is clear that Saddam Hussein has no respect for human life, most particularly the lives of Iraqi citizens. He also supports terrorism. How did he remain in power? To a certain extent, his repressive regime and the military arsenal he managed to retain discouraged internal dissension in Iraq. It also effectively prevented coup attempts facilitated by foreign covert activity. Prior to the Kuwait episode, it appears that his strong-man rule was even supported by most Western powers as means of unifying a religiously divided Iraq and to serve a bulwark against neighboring Iran. But his main protection was the reluctance of all nations to interfere with another nation's sovereignty even when such sovereignty is manifested by irresponsible oppression. The effort of the United States to escalate the anti-terrorism campaign to include an invasion of Iraq caused significant international discomfort. Ultimately, only the U.S., Britain and a few other countries were willing to conduct the military campaign against Iraq.